The brown ones here. Maybe 3" long or so. They give a nice, rusty colour to a chilli or stew, without much heat. Anyone going to brave growing the Mulato's then ? I can recommend them if you like a Mexican mole. I was going to give them a try, CH, but now you've made me wonder by asking if anyone is going to brave growing them! Definitely don't want blast-my-head-off chillies. Don't be too worried. 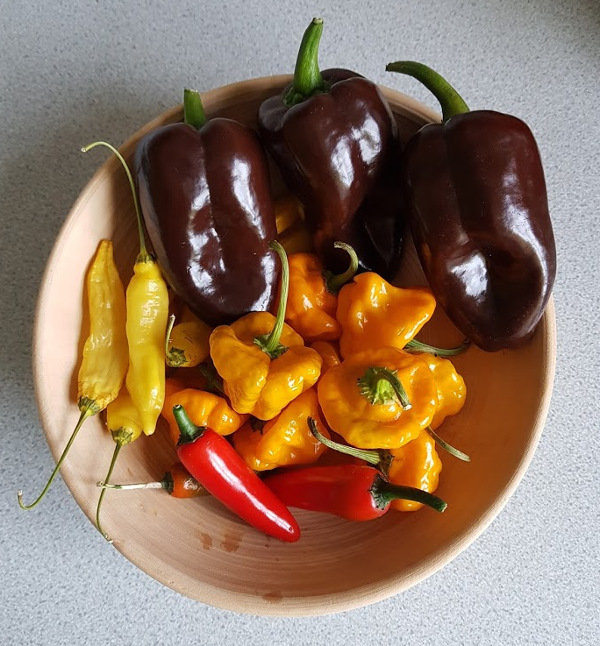 On the Scoville scale of chilli heat, Mulato is 2000-3000, so a bit hotter than Ancho, but not as hot as Jalapeno, and definitely not Cayenne, Birds eye etc. I would probably not notice the heat of one of them in a dish for us 3. I would approach with caution the ones above the 100,000. Red Savina is quite hot enough for most of us Those above 1000000 are more to do with bravado than culinary value. I have been thinking about requesting a 'go' on the seed swap but wonder if I've left it too late now. If so, not to worry. I haven't got much to offer at the moment but I'll see if I can get better at collecting seed in the coming season. I think not FloBear as I still have the package. Just finished with it now. Need to check with Dandelion that I was last on the list, so I may be able to pass it straight on to you. Brilliant, thanks Freebird. If it's a go-er I'll pm you my address. I've not heard back from Dandelion yet, but PM me your address anyway. I'm pretty sure there is no one else to come. I'm pretty sure it has been round the usual suspects Dandelion -> Ploshkin -> Me -> Freebird, so I'd assume it's ok to go to FloBear - it can always visit anyone we've forgotten afterwards on its way back to DL. Dandelion has given the all clear, so hopefully FloBear, you will have the package tomorrow or Monday. Don't do what I did - forgot it was coming so when it did, wondered what it was. Opened it not very carefully and all the packaging ripped , seed packs all over the floor. I shall look forward to its arrival. Seed packet has just arrived. Have had a little look through - now need to make some decisions! Perhaps you'd kindly pm your address so I can send it back in due course. I have finally managed to take the seed swap envelope to the PO so it will be winging its way back to Dandelion. The seeds are back with me - the swap is over for another year. Now all we have to do is grow them!! My Rose de Berne tomatoes from the swap have germinated. I don't think it was me that put those in, but they are a nice tomato, I think. I have a couple of bloody butcher tomatoes germinated. Most of the tomatoes are up now, so I should have some spare to share with Dad if he doesn't get his own sown. I suddenly remembered that this is the time of year I usually start the seed swap off. To be honest, I haven't got much to put in the swap envelope myself this year, as I just didn't grow anything from seed last year. There are the seeds which I finished up with from last year which I have kept in a cool place. What do you think? Shall I send it out? I know this sounds a bit half-hearted, but I don't want to get you interested but then there's nothing new. I won't have much to contribute. Nearly everything I grew last year was from old seed, the seed swap or bought plants. I need to have a good restock this year as I haven't got much in my box now. I have had a big clear out of out of date seed, and some varieties I didn't think much of - enough so as to not want to share. And I've ordered a fair few new seeds. Ok, too many new seeds from Seeds of Italy, Real Seeds and T&M (the latter mostly for cucumber Cuicino, which is excellent). I like the idea of the seed swap and would miss it, but I also wonder if the circle gets too small we won't end up posting around the same set of seeds that none of us particularly want ! As an alternative thought, I wondered about creating - or is it recreating* - a forum seed exchange thread. Bit like Freecycle - where you can post wanted or offered varieties / wish lists. Transactions to be completed by PM & Royal Mail (no real addresses on the forum !). As most seeds could be second class, or perhaps for beans 2nd large, postage should not amount to much compared to a big bundle. This could allow those of us who've bought seeds which come in large packets to split them with someone, for example. Seeds of Italy are usually very generous with quantities. I have this feeling that we once had a forum members swap shop / exchange / whatever. I fear it was not much used, but it might have been wider remit than just seeds. Craft items too ?